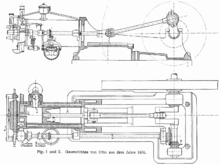 Nikolaus August Otto (June 14, 1832 - January 28, 1891) was a German engineer. He is the inventor of the internal-combustion engine. This engine was the first to burn fuel directly in a piston chamber. Up until his invention, all engines were external-combustion engines steam engines and burnt their fuel in a separate compartment. This page was last changed on 3 July 2017, at 14:20.